‘Your child is missing – presumed dead.’Hours after receiving the phone call that every mother dreads, Alida Salter flies to India to search for her backpacker daughter. The discovery of disturbing collages in Mia’s hotel makes Alida suspect a connection between the disaster that fractured their relationship thirteen years ago, and Mia’s recent, mysterious disappearance.Mia is no ordinary girl. Growing up with the sensory condition synaesthesia – where she sees the world in a kaleidoscope of shapes, colours and smells – she has gone through life with the vivid imagination of an artist, but for years she has shouldered an overwhelming burden of guilt. It has been a difficult relationship, but now comes the toughest test of all…Alida must find the courage to trust her maternal instincts, or lose her daughter forever. The start of the book was deliberately intriguing and overwhelming in its introduction of the experience of synaesthesia. One person found the ending predictable. All readers found the book interesting and we thought it covered lots of ‘issues’ especially grief, forgiveness and searching for acceptance. The mother, Alida was annoying to some readers. The characters were all lost in their grief and couldn’t really help and support each other. One reader found the subject of synaesthesia very interesting and the description of Mia’s view of people and her experiences were fascinating. 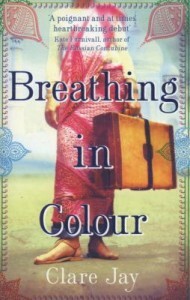 This entry was posted in Fiction and tagged Author, Book Club, book review, books, Breathing in Colour, Clare Jay, Parramatta City Library, reading, Writer by admin. Bookmark the permalink.